What compels someone to collect for a games console they never owned as a kid, thus eliminating nostalgia from the list of factors? What compels that same someone to collect for a video gaming console that is widely considered “below average” in terms of games, graphics, and overall fun, thus eliminating the desire to use that console for regular gaming? Finally, what compels that someone to not only decide they want to collect a for a console that they never owned and won’t often play, but also decide they want to own that console’s entire library of games (albeit a small, manageable one)? The easiest answer is that particular someone (ok, it’s me… I’m that someone) is simply a collector of video games and video game consoles. The video game console I’m referring to is the RCA Studio II, a widely forgotten system from the late 70s that many “collectors” no longer give a second thought to today. The collector in me has always had a goal: from the time I got into the collecting aspect of gaming in the late ’90s, it has been my desire to own every console ever released in the United States. I never felt compelled to expand that collecting goal to the entire world as the thought was daunting and a bit too unattainable. I like attainable goals, which is another reason why I chose to collect for the RCA Studio II. You will never hear me declare that I am attempting to collect the entire libraries for consoles such as the Atari 2600, the NES, or the Sony PlayStation with their hundreds and thousands of games, some of which are ridiculously expensive. As I said, I like attainable goals. For example, a complete NES Black Box set (ideally CIB, but that damn Donkey Kong Jr. Math box…), a complete set of Castlevania titles across all platforms, a complete Vectrex collection, a complete RCA Studio II library — Wait….why? I think the next reason might help explain my motivations. The RCA Studio II is old. I’m old. I think there is something in me that wants to preserve things that existed when I was a very young boy. 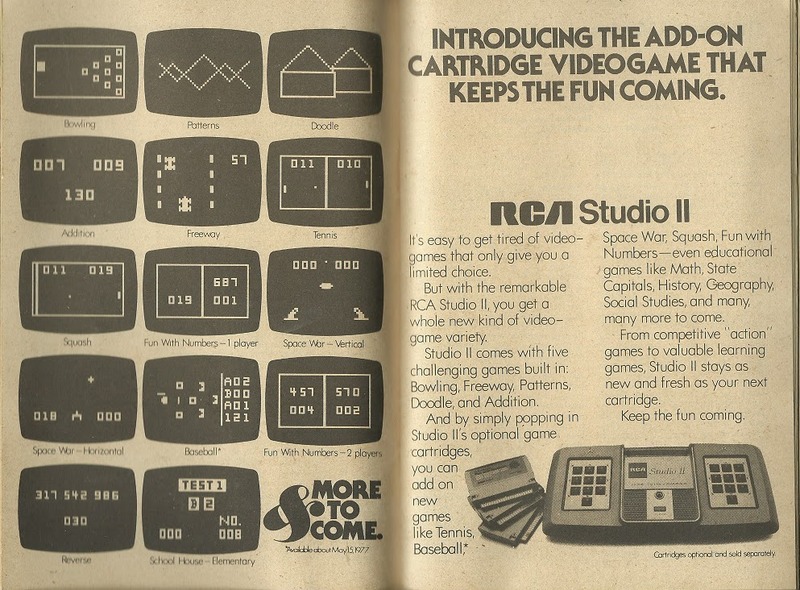 The RCA Studio II was released to little fanfare in 1977, shortly after the Fairchild Channel F and before the Atari VCS/2600. 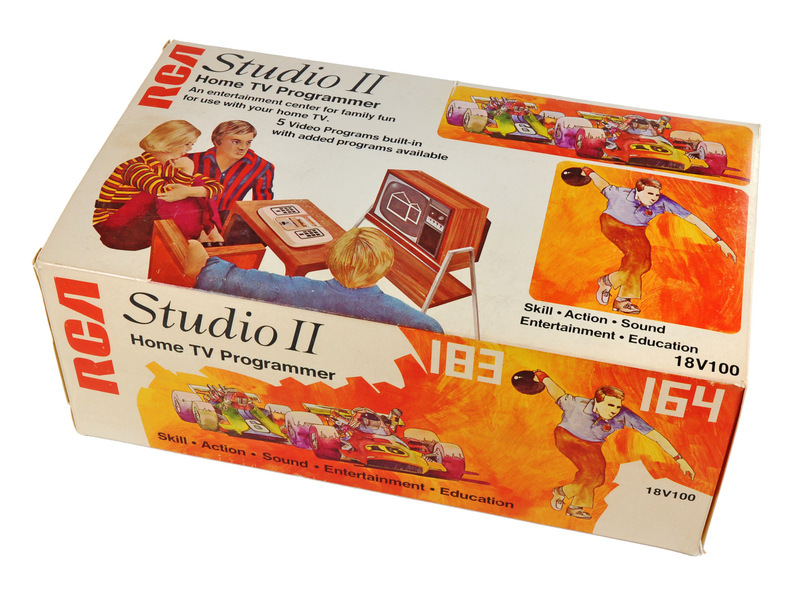 It was meant to compete against the Pong and Pong clones that had cluttered toy shelves for the past few years by offering a variety of titles that Studio II owners could play instead of the simple, yet still fun, Pong. The problem was that while the Channel F offered full color graphics for their ROM cartridge- based console, the Studio II was stuck offering games in black & white. The Channel F had innovative controllers with knobs that could twist to make games such as Pong easy to play. 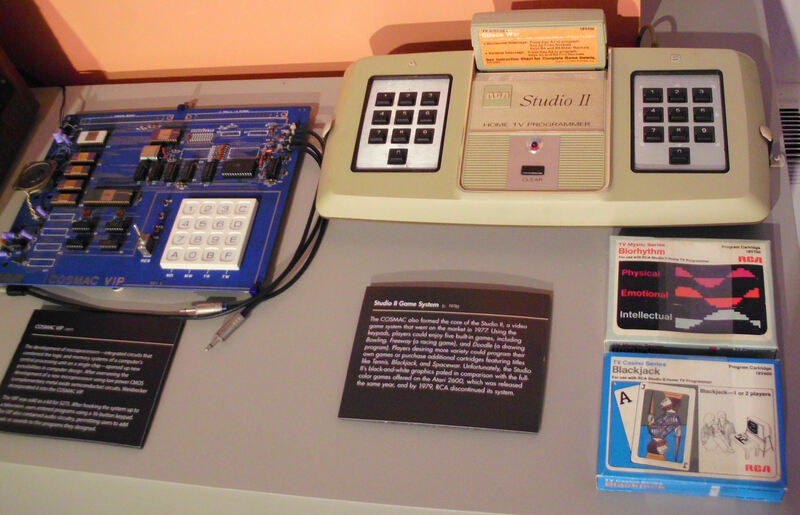 The Studio II had no controllers and was saddled with keypads attached directly to the console, meaning that players had to hover around the little beige box. Not a great set up, and not a great competitor to the Channel F.
A mere 10 months after its release, the Studio II would find even greater competition in Atari’s Video Computer System and with it’s even more advanced games such as Combat and Air Sea Battle, there was absolutely no reason for anyone to buy and own a Studio II. Less than one year after it’s release, it was discontinued. With a bit of history and context behind my motivations, I guess I would have to say that its age combined with its obscurity and relative rarity (it’s estimated that less than 100,000 units were sold) has endeared me to the RCA Studio II. This is not a console that many are clamoring to preserve. YouTube personalities aren’t highlighting its hidden gems or making Top 10 lists for it. There aren’t Facebook pages dedicated to the Studio II fanbase. However, combined with all of the other reasons I’ve highlighted, I feel it is my responsibility to ensure that one of the very first video game consoles, no matter how sad the game library is or how difficult the system is to hook up and actually play, is preserved. It wasn’t a piece of my personal history, but it could have been. I’m now old enough that the RCA Studio II could have been my family’s first console, if purchased at an affordable price once it was on clearance. For me, that’s a good enough reason to buy it and collect all the games possible. My quest to collect a complete in-box set of RCA Studio II games required a little bit of research to figure out exactly what I was collecting. As previously mentioned, there isn’t a whole lot of dedication to preserving the history of this console available online. I already knew that the Studio II had five games built into the system; Addition, Bowling, Doodle, Freeway and Patterns, but built-in games rarely count towards completing a console’s game collection since you inherently “own” those games simply by owning a working console. None of those games were ever sold separately, either. Beyond those built in titles, I needed to do a bit more digging. What that leaves for me to collect are the games that were sold separately — 11 of them in total. 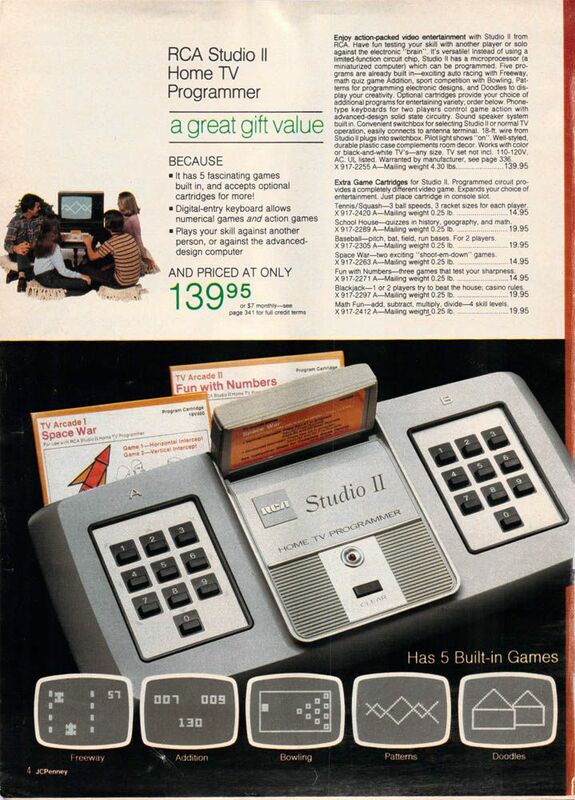 Studio II games were sold in little rectangle boxes color coded by series (the first console to do this). Orange-colored boxes represented games from the TV Arcade Series, blue-colored boxes represented the TV Casino Series, red-colored boxes represented the TV School House series and light blue represented the TV Mystic Series. 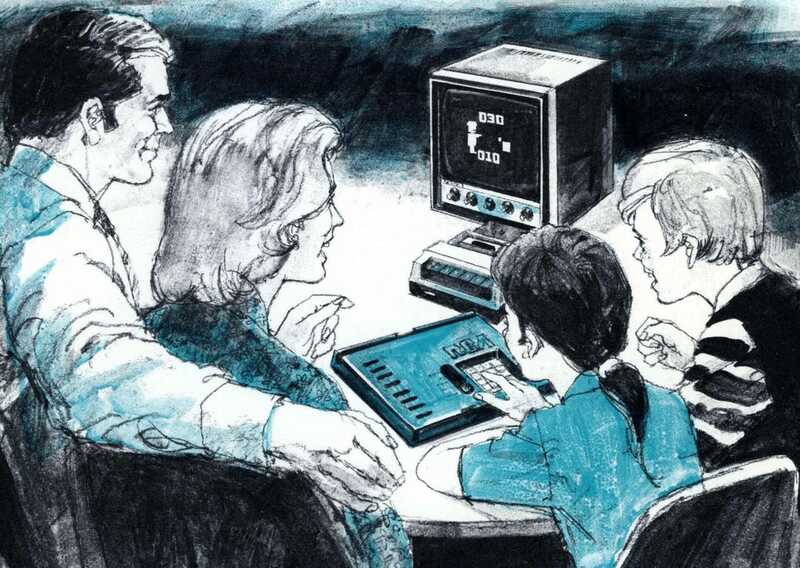 The boxes included simple drawings that represented the style of gameplay found on the cartridge, and typically included a stock drawing of a man and woman sitting on the floor next to the Studio II console, which was positioned on a small table in front of a television. They are both staring at the TV, neither of them actually touching the console, which would be required to play, and both have blank looks on their faces. The interesting aspect of this drawing is that the TV changes with each title, as the gameplay shown is meant to somewhat represent the game inside the box. For example, the drawing on the TV screen shows what appears to be numbers for a game titled Fun With Numbers. For a game called Tennis/Squash, a Pong-like screen is shown on the TV, giving potential consumers a hint that this game was a Pong clone. Because what self respecting ’70s console would be without a Pong clone? Not the RCA Studio II, that’s for sure. There is one game released in (extremely) limited quantities that will trip up just about every RCA Studio II complete set collector, TV Bingo. According to Wikipedia, there are only two TV Bingo titles known to exist, as it was apparently a very (very) limited release and never sold in stores. As soon as I read that only two TV Bingo games were known to exist, my heart sunk a little bit, as I realized that owning a complete set of RCA Studio II games was going to be almost impossible. Some of these games have been easy to procure as they must have been some of the better sellers for the system. Others, such as Biorhythm & Speedway/Tag are less commonly found, or when they do show up on online auction sites, sellers want more than I’m willing to spend. However, I do think that getting all but this lone anomaly to complete my Studio II set is achievable. Then I can rest knowing that at least one more obscure console and its library of games will be preserved in my collection.